As Christians, we’re pilgrims on our way to Heaven. But sometimes we can get so anchored in the things of this world that we forget that we are to truly long, or yearn, for Heaven. The Book of Revelation exhorts us to pray, “Come, Lord Jesus!” Heaven will be so far beyond what we can imagine, and, of course, so much greater than life here on earth. 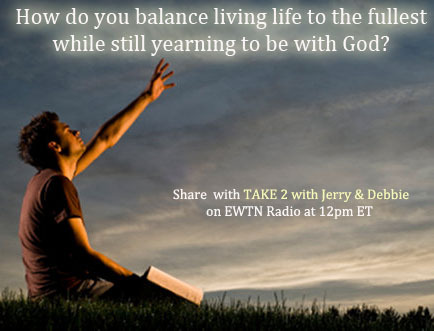 Yet, how can we balance living this life abundantly, while still saying to ourselves, “I can’t wait to get to Heaven!”? That’s what we’ll discuss on Friday’s show. Be sure to call and share your take on yearning for eternal life! I am so glad your first caller talked about daily Mass, because the Mass is the closest we can get to Heaven on this earth. Jesus brings Heaven to us when we receive Him in the Eucharist and all the saints and angels and loved ones come to share with us this miracle. Yes there is a longing to have complete joy and peace with Christ and our loved ones in Heaven but we still are so sad when we lose a friend or family member to death. I guess it is because we will feel the loss while we are still on earth. And there is still the thought that for our family we don’t want to leave them too soon. But it is God’s timing for all these things, so we find joy when we know that our loved ones are in Heaven.